I am a big fan of group work tasks as a way of getting students interacting with each other and sharing their expertise. 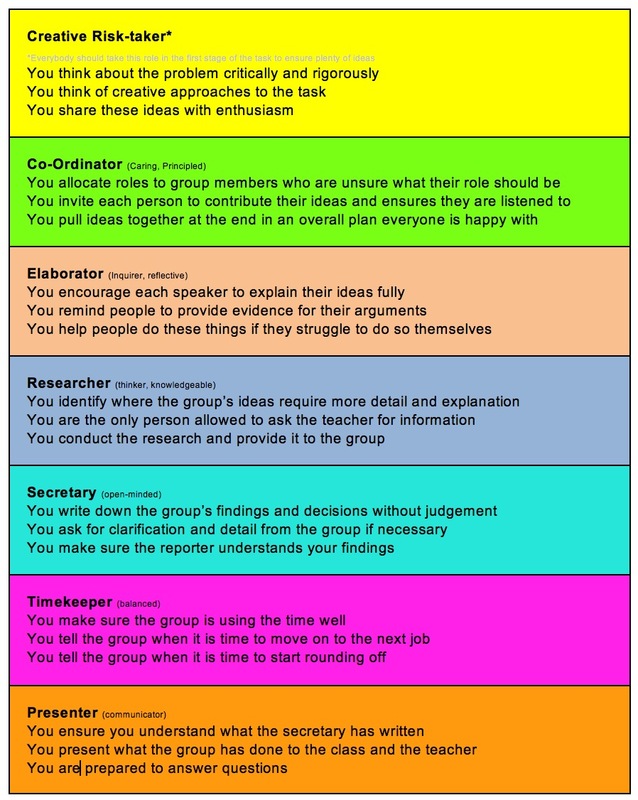 peer assessment slips are useful at the end of the exercise to measure the contribution made by each team member, but to ensure that each student is able to contribute effectively and independently, consider giving each person a different role card. The De Bono ‘6 Hat’ Approach is a great starting point, but not always appropriate for the task, so customised cards are usually a good idea. I liked the idea of developing something incorporating other ideas like those suggested by Benne and Sheats’ Group Roles. Flexibility is key. These instructions are therefore designed to work with any size of group. Stage 1: Everybody in each team should be a ‘creative risk-taker’ and have some time to reflect individually on a suggested approach to the task. Stage 2: Each member of the group takes at least one of the remaining role cards after taking the time to read them (they may choose more role). The group will need at least one co-ordinator, who can help the other members decide what roles are important for the success of the task and which are be suited to different members of the team. Stage 3: The co-ordinator(s) chairs the discussion. The elaborator(s) makes sure ideas are being explained fully at each stage. The researcher(s) identify where further research is needed and conduct this. The timekeeper ensures that the pace of the task is maintained. The secretary keeps a record of the ideas decisions. The presenter(s) are responsible for converting the work of the secretary into a class presentation. I am particularly keen to hear suggestions about how these cards might be improved / developed further – contact me with your ideas either by adding a comment or contacting me on Twitter (@russeltarr).